What is the difference between corporate sponsorship and fiscal sponsorship? Corporate support usually consists of goods or money given directly to the project. Often the Corporation expects something in return for this donation, like advertising or the use of the project for publicity purposes. Fiscal sponsorship allows artists to gain access to funding opportunities that are only available to 501(c)(3) tax-exempt organizations. Does From The Heart‘s fiscal sponsorship provide direct funding? No, but it allows you to apply for grants that require a non-profit status. You can apply for the Dean grants and you will find all that information separate on the web site. FTH being your fiscal sponsor will not keep you from entering the Roy W. Dean Film Grants. What types of projects are eligible for fiscal sponsorship through From The Heart Productions Inc? We accept film and media projects. That includes documentary, feature film, short, web series, fiction or non-fiction. It can be at any stage of production including completed (since you may need post production and distribution). Is there a minimum fundraising goal for fiscally sponsored projects? Yes, We require all projects we accept into fiscal sponsorship to have at least a $10,000 fundraising goal. There is a $82 non-refundable application processing fee which is tax deductible. All funds donated are distributed less a 5% administrative fee for checks and a 7% fee for credit card donations (this includes the credit card processing fee. There is an additional 1% fee for all credit card transactions made from outside the U.S. These fees covers our legal, administrative, and accounting costs. Can my fees go down the more I raise? Yes. We’ve got a sliding scale that reduces your fees based on what you raise. Does From The Heart work with crowdfunding platforms? Yes. From The Heart Productions Inc was one of the first non-profits to work with crowdfunding platforms with fiscally sponsored projects. We fiscally sponsor films on Kickstarter and Seed & Spark, and other sites. We’ll help you choose the best platform for your crowdfunding campaign. Why are fiscal sponsorship fees lower when I crowdfund my film? We realize that crowdfunding platforms have their own set of fees. These include their administrative fees and credit card processing fees. So, we’ve reduced our fee for those campaigns to allow you to keep more of what you raise. Is there an application deadline or application window? No, applications can be submitted at any time and will be reviewed when received. It takes between 7 and 10 business days for FTH to review. Can I get my project reviewed faster? Yes, we offer an expedited review within 3 days for an additional $50 processing fee. The application for fiscal sponsorship goes to the From the Heart Fiscal Sponsorship Review Committee. What criteria do you use in whether or not you accept a project to fiscally sponsor? Many factors go into our decision. The most important is whether the project fits our mission. Also, what is likelihood the project will get made. How many projects are approved? Over 95% of the projects are approved within the 10 days it takes to handle the application. Can I reapply if not accepted? Yes, FTH will discuss with anyone how to improve their project’s likelihood of getting made. We will also help them complete their application if there are any questions so that it can be considered for approval for fiscal sponsorship. When do the donated funds become available? Checks are sent out 15 days after receipt of funds. Can I start accepting donations and applying for grants through From The Heart while I am waiting for my fiscal sponsorship application to be approved? You must wait until we’ve signed an agreement to be your fiscal sponsor. Until then, your project is not sponsored by FTH and can’t solicit donations or grants on your behalf. Can From The Heart pay specific expenses for my project? We will set up an accounting file showing your incoming funds and out going payments with a report of the balance you have on your account. This will be submitted to you after each payment. Please discuss with Shirley what your needs are to get the costs. Does fiscal sponsorship allow the project to be absolved from tax reporting? No, projects that raise funds through FTH are responsible to report all the income to the federal government and pay taxes accordingly. Funds received through a fiscal sponsorship are considered income and are potentially subject to taxes. All payments made to individuals must be reported by FTH to the IRS on a 1099 form. Payments made to Corporations will not be reported on a 1099 form. Can people donate food, goods, and services other than money? Yes, we accept non-cash donations of tangible items. We will give the donor a letter of thanks and a receipt noting the items donated. Just send us a list or description of the donation, amount, and where to send the letter. Any kind of item can be donated. We can accept almost any type of donated noncash item for the purposes of a project and issue a receipt to the donor for the item. However, we cannot, however, issue a donation letter for any large items such as boats, cars, or jets at this time. Donations of intangible services such as legal services or rent free office space are very valuable but are not tax deductible under the law. For that reason, we can’t issue a receipt for those types of donations. Can I receive donations through Facebook? We advise fiscally sponsored filmmakers not to solicit donations via Facebook at this time. While Facebook does give donors the ability to donate to From the Heart Productions through Facebook, these donations are processed and distributed to From the Heart a a lump payment. So, there is not a way at this time for us to definitively determine where the money originated and to whose project it was intended. Do you accept stocks and bonds as donations? Yes. From The Heart now accepts stocks and bonds as donations. Your donor would transfer the investments to our brokerage account for our non-profit. The fiscal sponsorship fees apply for the donation along with any incidental brokerage fees. Funds will be available in approximately 14 days. 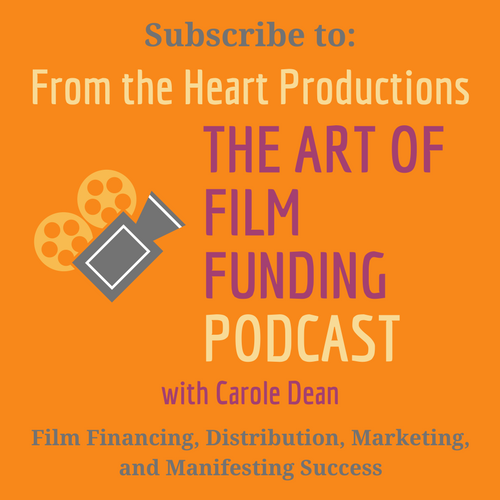 Do I have donors make the check to From The Heart or my production? All checks must be made out to From the Heart Productions, Inc. Otherwise, we will not be able to give them the tax deduction (or deposit the check!). Have the donor put the name of the production in the memo section of the check. Can you accept donations by credit card? FTH accepts all major credit cards, paypal payments, and wire transfers. You do not need to be a U.S. citizen for From The Heart to be your fiscal sponsor. One way is for one of your project’s named project directors will need to have a social security number, EIN (employer identification number), ITIN (independent taxpayer identification number), or other type of IRS registration. Another involves completion and filing of a W8 form with the IRS. Please also be aware that funds released to Non US residents may be subject to mandatory withholding by the US Government. Please contact us before you apply to discuss your situation.
. We can guide you in the best options for your production. Does using From The Heart as a fiscal sponsor give them any creative control or rights on the project? As your fiscal sponsor, FTH will not interfere with the intellectual property rights to the film or lay any claim to them. However, we’d love you to put our logo on all printed and online materials while we are your fiscal sponsor as well as in the film’s end credits. If you want to invite us to the world premier or Oscar ceremony, that would be nice. We will get our own limo. What does From The Heart do with the fees they receive from the donations? Besides covering costs and administrative expenses, FTH has run the Roy W. Dean Film Grant since 1992. Given to a filmmaker with a project that is unique and makes a contribution to society, the grant is awarded three times each year. A good portion of the fees from fiscal sponsorship goes back into the grant. Can I have more than one fiscal sponsor? Possibly. FTH generally doesn’t allow its fiscally sponsored projects to have additional fiscal sponsors. But, if you only want to use From The Heart as a fiscal sponsor for your IGG fundraising, we will allow you it.